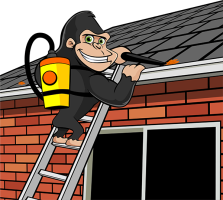 When your home needs a sprucing up, Nanaimo Gutter Cleaning will answer your call! Nanaimo is known as the Harbour City due to its rich naval heritage. Nanaimo is a proud city, finding its strength from its independent beginnings as a port city. Although they are only 50 kilometres apart, the predominant plant life is very different from the island and mainland. Mosf trees in Nanaimo are varieties of Fir Trees, meaning that they have needles instead of leaves. When these needles fin their way into gutters and downspouts, they become nearly impossible to remove. Once a foundation is formed inside the gutter, the needles collect other natural debris. This buildup prevents the flow of rainfall through gutters and spouts. Without proper drainage, moisture collects in the debris and can quickly become home to insects, small animals and sometimes whole plants! Mice, Squirrels, worms and other animal and insect life can make homes inside plugged gutters. Pests also have the potential to find their way into the home itself. Nanaimo Gutter Cleaning will remove any blockages that form over the passing of time, cleaning, as well as flushing an testing gutters and downspouts.As well as animal life, Nanaimo residents should be aware that plants also enjoying making their homes in clogged gutters. The damp conditions as a result of water being unable to pass through the gutter system combined with organic material and debris, have been known to foster plant life. Plants, although ordinarily small, can cause large-scale problems for homeowners. Nanaimo Gutter Cleaning recommends service anywhere from two to four times per year, depending on location and environment of your property. This routine will ensure free-flowing gutters despite seasonal changes, and will reduce the risk on property damage due to infestation or plant growth.